Ernest Hemingway liked to drink. Often. In quantity. And long into the night. He inspired some drinks, too. Including this one, most likely. It features grapefruit juice – one of his favored cocktail mixers. So Hemingway loved this drink. We predict you will too. But watch that quantity thing. 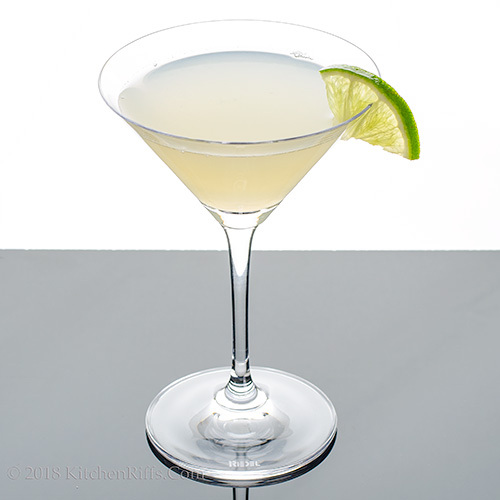 The classic Daiquiri Cocktail is a soothing mix of light rum, lime juice, and simple syrup or sugar. The Hemingway Daiquiri drops the sugar (usually) but adds grapefruit juice and maraschino liqueur. The result is an even more refreshing take on the classic. We’ve seen numerous recipes for this drink, and have tried several. The one we post here is our favorite, though we discuss alternatives in the Notes. Add all ingredients (except garnish) to a cocktail shaker half filled with ice. Shake until the contents are well chilled (20 seconds or so). Strain into a cocktail glass, preferably one that’s been chilled. Add garnish, if desired, and serve. Some folks like to serve this drink frappé style – that is, strained into a cocktail glass or goblet over shaved or crushed ice. Frappé cocktails were an early version of today’s frozen blender drinks. Hemingway may have preferred this drink served frappé. We don’t, but try it if you’d like. Hemingway probably favored a much heftier version of this drink called a Papa Doble (also known as “Daiquiri No. 3”). 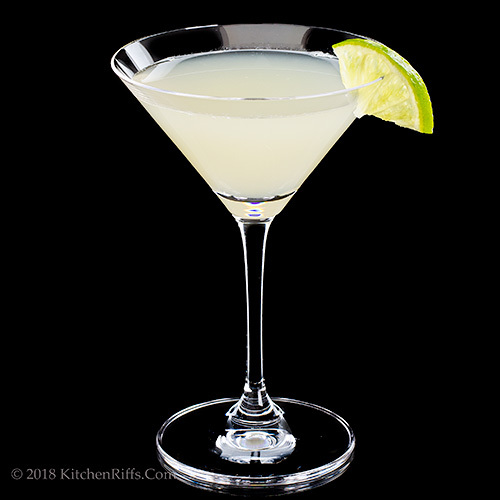 If you’d like to try one, here’s the best recipe we’ve seen: 3¾ ounces white rum, 2 ounces fresh lime juice, 2 ounces white grapefruit juice, and 6 drops of maraschino liqueur. That’s a big drink! And Hemingway didn’t stop at just one. Legend says he drank 16 – S I X T E E N – of these one night at Havana’s legendary Floridita bar. The Floridita was where the Hemingway Daiquiri (and the Papa Doble) were invented, probably in the 1930s. Their creator was almost certainly Constantino Ribalaigua Vert, owner and chief bartender. Hemingway hung out there a lot, as did Ezra Pound, John Dos Passos, and Graham Greene. The Papa Doble is drier than our version of the Hemingway Daiquiri (because it uses very little maraschino liqueur). We recommend using only white rum in this drink. Some people substitute amber, but the flavor just doesn’t work as well in our opinion. Any brand of good white rum will work, though better-quality rum makes for a tastier drink. If in doubt, ask the friendly folks at your local liquor store for suggestions. BTW, if 2 ounces of white rum are too much for your taste, reduce it to 1½ ounces. The drink will still taste good. Want a slightly sweeter drink? Try 2 ounces white rum, ¾ ounce lime juice, ½ ounce grapefruit juice, 1 teaspoon simple syrup or sugar, and 1 teaspoon maraschino liqueur. Another version of this drink that’s pretty good: 1½ ounces white rum, ¾ ounce lime juice, ¼ ounce grapefruit juice, and ¼ ounce maraschino liqueur. Maraschino liqueur is made from distilled Marasca cherries. It’s clear liquid, with a slightly bitter almond flavor. Maraschino liqueur is fairly dry, with just a bit of sweetness. The brand you’re most likely to see is Luxardo. Do not be tempted to substitute liquid from a bottle of neon-red maraschino cherries. It’s way too sweet and has the wrong flavor profile. We recommend using unsweetened white grapefruit juice in this drink. The red/ruby stuff is way too sweet (and it’s the wrong color for this cocktail). Fresh squeezed is always ideal, but canned/bottled juice works too. Remember that grapefruit juice can react negatively with some prescription medications, like statins. So check the warning labels on any medications you may take. And if in doubt, discuss it with your doctor or pharmacist. 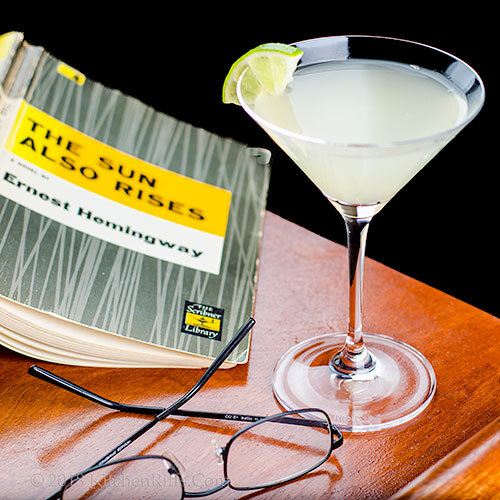 Hemingway was a frequent and adventurous drinker. If you’d like to read about some of the other drinks he favored, check out Philip Greene’s To Have and Have Another. “Though definitely faster if he had the doble version of this drink,” I said. Ouch. That’s the truest sentence I know. I'm delighted to see this. Rum is being neglected these days as other liquors are having their day. We do like not-so-sweet cocktails, but does the maraschino liqueur deliver enough of a sweet touch here? That said, I love the tart brightness I know the grapefruit juice will bring to it. And I'm always happy when I read your notes—there's always some gem buried there. To Have and Have Another? Perfect! Hi Terry, the sweetness of this is perfect, IMO -- the maraschino is sufficient. Although you could also add a bit of simple syrup if it isn't enough. Thanks for the comment. That's great information about all of the literati who drank at The Floridita in the 1930s. I wonder what else is known about Constantino Ribalaigua Vert, owner and chief bartender. Hi Mae, Constante -- as everyone one called Constantino Ribalaigua Vert -- was a pretty interesting guy, and probably did more than anyone else to perfect the regular daiquiri we all know and love. There's actually a reasonable amount of info available on him out there on the interwebs. Thanks for the comment. I love love Key West and wish I had been a mouse around to watch Hemingway, or be one of his cats back then! What a life! He was a great writer, as in "A Farewell to Arms," what a book, plus all the rest! And the perfect quote from that book, "Nothing ever happens to the brave." He had a commanding flawed personality and he definitely enjoyed a drink or 20. Supposedly he got drunk and slept with a bear once. Plus, he was a looker! I love Daiquiris, grapefruit juice and Ernest Hemingway so your cocktail is a win, win, win for me!!! Very nice post and drink, thanks! Well that says a lot about someone if they drank so much many cocktails are named or inspired by them, but he had good taste. This looks FAb with the grapefruit juice (and marashino liqueur good to point the disctinction). I'd be saying A Farewell to Legs if I drank 2 of these, let alone 16! This is the first time I've heard of maraschino liqueur. I love all the notes you include with your recipes. Hi Pam, bet you'll LOVE this drink! The daiquiri is one of our favorites drinks, and this one is every bit as good. Might even be a tad better! Thanks for the comment. Hi Evelyne, this is indeed a FAB drink! And Hemingway was a character, wasnn't he? Thanks for the comment. Hi Jean, yup, two of these would be my limit. Can't imagine more than one of the doble version! Thanks for the comment. I think I might have to channel my inner Hemingway. Surely drinking these gave him great vision and the fortitude to see the sun rise. Or set! Hi Abbe, I think he saw it rise after it set. :-) Thanks for the comment. I have everything to make this minus the grapefruit juice. Can't wait to try it! love your rum concoctions! Hi Ashley, it's really a good drink. We love rum! :-) Thanks for the comment. Hi Tricia, this would be a wonderful beach drink! :-) Thanks for the comment. Oh, I just finished juicing up a whole lot of grapefruits- taken from my neighbor's tree. This should set me up for months with this cocktail! Hi Fran, great timing! Enjoy. :-) Thanks for the comment. You and I ride the same wave on cocktails. This Hemingway special looks delightful. Seeing that Hemingway spent a lot of time in Key West ( Southern most tip of the U.S.) and a place where grapefruits are abundant, its no surprise it was one of his favorites. Hi Velva, Key West is fun! We've been to Hemingway's house there -- really worth seeing. Thanks for the comment. Hi Rocquie, Hemingway could pack it away, couldn't it? Cocktails are fun, but not as many as he often drank! Thanks for the comment. John this drink is fabulous. Can't wait to give it a try as you know we love grapefruit juice. Sounds refreshing. You and Ms. Riff are making us laugh again as always with your end of the post antics. Wishing you a super week. Pinning, of course! Hi Bobbi, this is a wonderful drink! 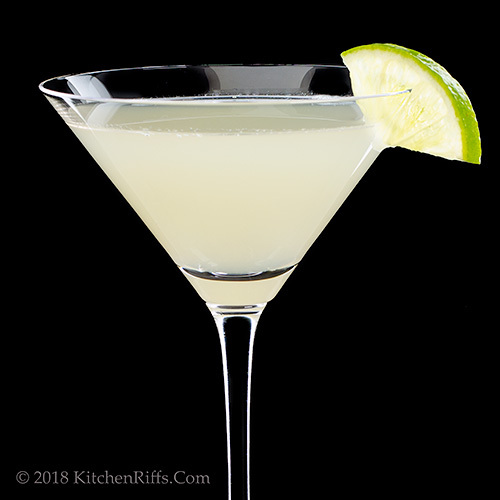 But then, the daiquiri is one of our favorites, and this is a fun variation. Thanks for the comment. Hi Merryn, yeah, 16 is just ridiculous, isn't it? Thanks for the comment. Sounds like a nice refreshing drink. I like the grapefruit in this drink. No matter how much I love this drink I don't think I could drink 16, I would be under the table way before that. Hi Dahn, it's a fun way to drink this! The original frozen daiquir. :-) Thanks for the comment. Hi Dawn, 16 is an astonishing number to drink! Hard to believe it's true, but apparently there are witnesses to the feat. Thanks for the comment. This sounds and looks fantastic, John. As always, gorgeous shots! Yum! More cocktails with grapefruit juice in! Deliciously refreshing. Hi Sherry, maraschino liqueur is really fun stuff! I'm not wild about its flavor all by itself, but it mixes in cocktails beautifully -- a wonderful ingredient. Thanks for the comment. Hi Angie, it's a great drink. And such nice, crisp flavor! Thanks for the comment. Hi Caroline, we've been on a grapefruit kick. :-) Thanks for the comment. Hi Kelsie, yeah, I'm surprised he got any work done, too. Although those were the years when his output was beginning to decline, so there's that . . . Thanks for the comment. Hi David, the Doble is too much for us! We'd just make one, and then split it. Hemingway, we are not. :-) Thanks for the comment. Good to know these stuff from history, I love that you always refer to the history of your cocktails. Lovely photos. Hi Amira, cocktail history is fascinating! Fun even if one doesn't drink. :-) Thanks for the comment. I love this story behind the drink and the shot with the book! LOVE rum drinks! And after visiting Miami and Key West in JULY, I think everyone would be drinking this frappé style! Wish the Hemingway house was open when I was there, but I did get to see it from the outside. Thanks for introducing another great cocktail that I need to try! Hi Amy, great story, wonderful book. And terrific drink. :-) Thanks for the comment. Hi Laura, good to see you! Key West is cool -- although bummer that you didn't get to see inside the Hemingway house. :-( Thanks for the comment. Hi Valentina, nobody can handle as many of these as Ernest. Nobody. :-) Thanks for the comment. You are the master of cocktails for sure! I’m a sucker for anything in a martini glass. 16? That’s a lot of cocktails! Anything with citrus always captures my attention. I can imagine daydreaming about Hemingway's adventures while sipping this drink. Perhaps this should be the drink served up this Sunday at our weekly BBQ! Oh John, another irresistible cocktail, I love the combination of lime juice and grapefruit...so elegantly presented...as always. Thanks for the recipe...have a wonderful weekend! Hi Deb, Hemingway gave us loads of adventures to daydream about! :-) Thaks for the comment. Hi GiGi, it should be! Just don't tell Landon about the 16 that Hemingway drank -- he might consider it a challenge. :-) Thanks for the comment. Hi Juliana, good combo of flavors, isn't it? Thanks for the comment. Sixteen! I can't imagine surviving, and if I did, how I'd feel the next morning. Maybe this drink it too delicious! Hi Jeff, I'm with you -- I don't think I'd survive that. Must have been a fun evening. :-) Thanks for the comment. Hi Carolyn, he probably did enjoy this both in Key West and in Cuba -- he spent a lot of time in both places. Thanks for the comment. Where are earth do you come up with all of these cocktails and notes about them? You certainly are increasing my repertoire. :) this does look like a wonderful little cocktail to go with a classic read. Hi MJ, we LOVE research. Particularly when the results are so satisfying. :-) This is a goodie. Wait until you see the one we have coming up in a couple of weeks! :-) Thanks for the comment. Hi Greg, I have a hard time drinking more than two -- that danger and stupid thing and all. :-) Thans for the comment. Hi Kriga, it is! :-) Thanks for the comment. Hemingway had great taste! This is a beautiful and delicious looking drink. Hi Pam, he knew his drinks, that's for sure! :-) Thanks for the comment. This is such a great classic cocktail. Very refreshing too! Hi Laura, it's a wonderful drink! Mr. Hemingway knew how to pick 'em. :-) Thanks for the comment. Hi Marcelle, this was a fun post to research. Lots and lots of research. :-) Thanks for the comment. Mmm another winner made with grapefruit juice! Hi Emma, we're on a grapefruit roll this summer! :-) Thanks for the comment.